Zendesk was able to make it to the top of the ranking thanks to three perfect 20 out of 20 scores in reviews, integrations, and mobile app availability. GetApp, a cloud-based business apps marketplace, has released its newest Category Leader ranking for the top 25 cloud-based help desk and ticketing solutions. Zendesk came in first place, followed by Freshdesk and LiveAgent in second and third, respectively. Designed to make it easier for business owners to choose the right help desk solution for their growing business, the ranking provides a quick summary of some of the best apps available on the market. Based on five data points, the apps are ranked for user reviews, security, software integrations, mobile app availability, and media presence. Each factor is worth 20 points, for a total possible score out of 100. “Zendesk was able to make it to the top of the ranking thanks to three perfect 20 out of 20 scores in reviews, integrations, and mobile app availability. Notably, it also scored highly for media presence and security, with 16 points each, to achieve an impressive 92 out of 100. Second and third-place Freshdesk and LiveAgent impressed with security scores of 18 out of 20, respectively, while Salesforce Service Cloud was able to nab a perfect 20 for its media presence to land in 8th place overall,” says ranking project manager Suzie Blaszkiewicz. 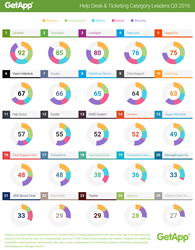 Click through to see the entire Q3 2016 ranking of top Help Desk and Ticketing software.